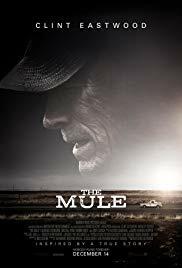 Based on the true story of a 90-year old horticulturist who ran drugs for the Sinaloa cartel, Clint Eastwood's new film The Mule is a straightforward story, simply told. Eastwood produced and directed the film in addition to taking the lead role, with his character's sensible driving serving as an analogy for his conservative style of direction. The slow and steady pace of the movie effectively establishes it's characters and puts the story in motion, but the plot itself feels like a foregone conclusion from the outset. You won't be bored watching The Mule, and there are quite a few funny and touching moments, but the story is ultimately too light and lacks any real substance.